Spring officially arrives in less than ten days! With temperatures forecast to hit 70 degrees Fahrenheit here in the Hudson Valley this week, it seems that winter may be on its way out a little early. Even so, the nights are still pretty cool, and I’m not entirely convinced Old Man Winter doesn’t have at least one more trick up his sleeve. We’ll see. 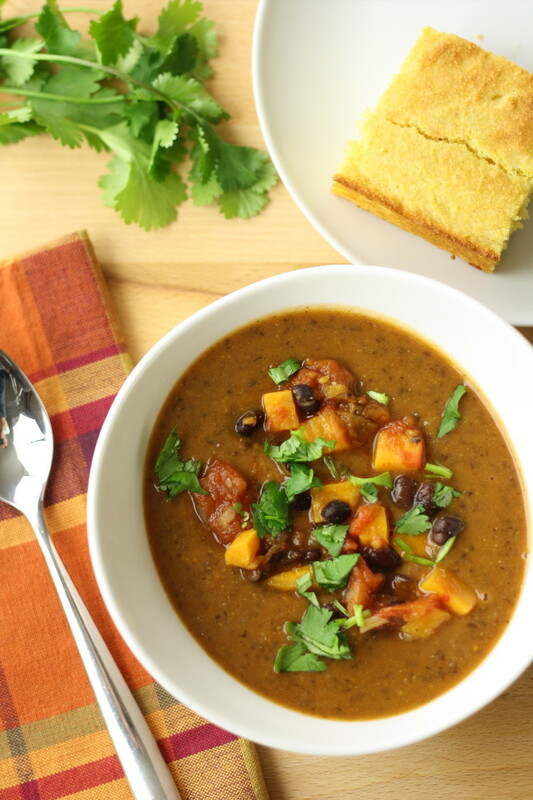 Just in case, we’re keeping this hearty, body-warming Sweet Potato – Black Bean Chili recipe at the ready. It served us very well recently when the mercury dipped, and we know it’ll serve us well again, too. Plus, sweet potatoes have been making a regular appearance on our menu lately. Sweet potato fries are perpetually popular in the Bronski household. And just this past weekend while visiting good friends in Boston, sweet potatoes again graced the dinner table, this time prepared two ways: as sweet potato chips (tossed in olive oil and seasoning) and as cubed, roasted sweet potatoes (paired with whole oven-roasted chicken and Brussels sprouts). 1. Heat about 1 tbsp or so of olive oil in a large saucepan. Then saute the onions until soft. 2. Add the sweet potatoes, and saute an additional 5 minutes. 3. Add the remaining ingredients through and including the chipotle powder (but not the lime and cilantro). 4. Bring to a simmer. Cook about 30 minutes, until the sweet potatoes are soft and the chili’s flavors are well developed. 5. Leave the chili chunky. Or, to prepare as we photographed the dish, reserve about 3/4 cup of the chili. Puree the remainder with an immersion blender to make a smooth, thick soup. 6. Mix in the lime juice. 7. Add back in the reserved chunky chili (for both texture and presentation). Garnish with fresh, chopped cilantro. 8. Serve with fresh gluten-free cornbread. For the black beans, we soaked the beans in water overnight. The next day, we drained the water and rinsed the beans. Then we added new water, and cooked the beans for 1 to 2 hours until tender. Drain the beans, and they’re ready to be used in the recipe! For the tomatoes, we actually used bags of frozen tomatoes from our garden, incorporating both the tomato “pulp” and the tomato “juice” from the freezer bags. We estimated them to yield about 3 standard cans of diced tomatoes, as called for in the recipe. This recipe is: gluten-free, dairy/casein/lactose-free, egg-free, fish-free, shellfish-free, peanut-free, tree-nut-free, soy-free, refined-sugar-free. The recipe is easily made vegetarian and vegan by substituting GF vegetable broth for the GF chicken broth. Per serving: 160 calories, 3g fat, 28g carbs, 6g protein, 165mg sodium, 6g dietary fiber, 3g sugars, plus 466mg potassium, and at least 200% RDA vitamin A, at least 30% RDA vitamin C, at least 20% RDA manganese, and at least 10% RDA vitamin B-6, copper, folate, iron, magnesium, and thiamin. Recipe nutrition info approximate, calculated using SparkRecipes. Your kitchen. Our recipes. Happy taste buds! 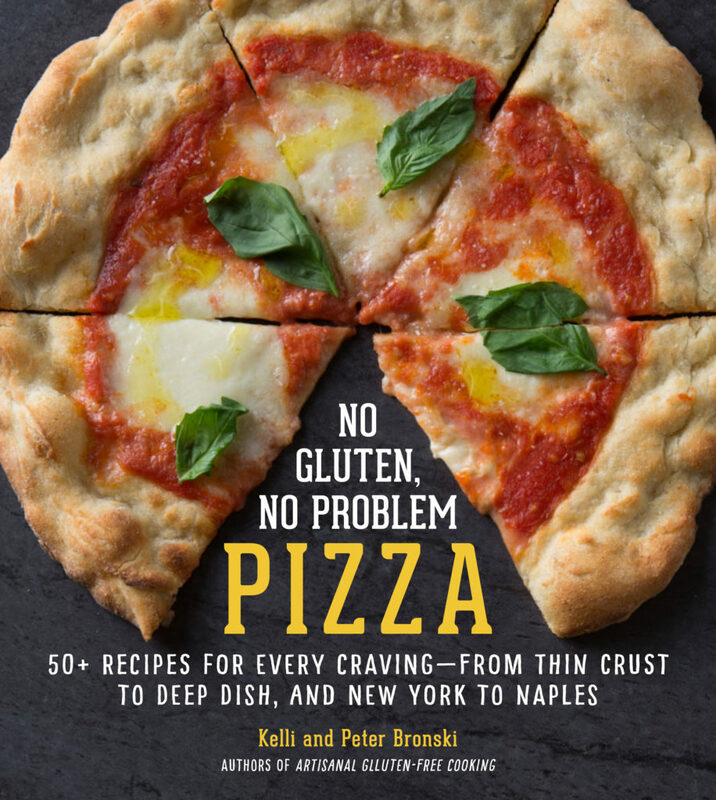 That’s the short story of No Gluten, No Problem. Want to learn more about us? 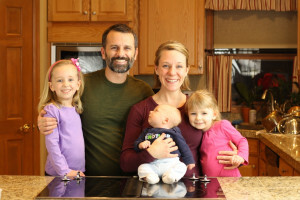 We’re Pete and Kelli Bronski, the husband-and-wife team behind the website. >> Get to know us better.